Ayers Creek Adventures is a family owned and operated business located on scenic Ayers Creek. 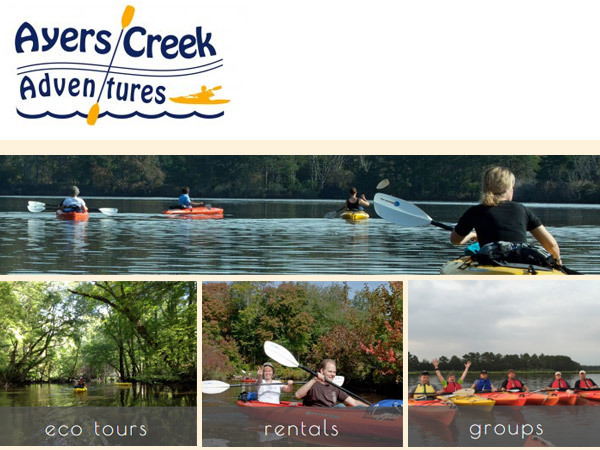 Ayers Creek Adventures provides exclusive access to the creek through kayak, canoe, and Stand Up Paddle Board (SUP) rentals, guided eco tours, kayak instruction, and group events. The owners, Steven and Suzy Taylor, live on Ayers Creek and have enjoyed exploring the surrounding waterways for many years. Their desire is to share the beauty of this magnificent resource with others in an environmentally sensitive way.